SPF recognizes that the Seattle Police Department, with more than 90% of its annual budget going to support personnel costs, has very little flexibility to seed new programs and encourage innovation. As modern law enforcement tasks continue to become more complex, the Seattle Police Department has increasing needs to stay current in training, technology and equipment, and communication and partnership efforts with the community. 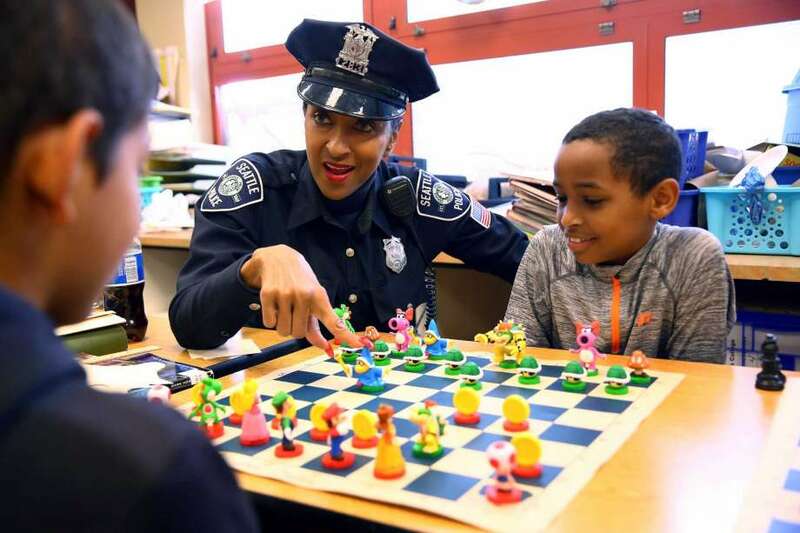 The Foundation utilizes the generous contributions of our fellow citizens and funding partners to enhance the Seattle Police Department’s efforts through the funding of grants. By supporting innovative projects in these funding areas, our public-private partnership allows the Seattle Police Department to launch innovative and experimental projects that further their ability to serve Seattle’s public safety needs. In 2018, Seattle Police Foundation funded nearly $155,000 in grants to SPD. This twelve-week program works with intercity teens, bringing a comprehensive workshop on various topics including, anti-bullying, gang and violence resistance, consequences of actions, peer pressure, alternatives to drugs and violence, respect, goal setting, giving back to the community, good decision making, getting to know the police, and what to do if the police stop you. The grant issued to this program will cover weekly snacks, notebooks, printed materials, instructors, guest speakers, and orientation dinner and much more. As a tool for community outreach and crime prevention, each precinct will get vehicle clubs to distribute to community members who are interested in protecting their cars from theft. The goal of this new program is to help decrease and prevent the number of auto thefts in Seattle. "I think this project will have a great impact on the community - as this is an additional tool that we can provide our community members to be more proactive in reducing their likelihood of being a victim of auto theft." The SPD Violent Crime Advocate Unit works with crime victims, their families, and cooperative witnesses to help support detectives assigned to investigations. The unit does not have access to funds that provide for the immediate needs of the group they serve. Temporary housing, emergency food, overnight stay vouchers, transportation needs, personal care items, and communication tools are all needed to help detectives stay connected with each victim. The financial support this grant provides will meet the immediate needs of victims who often find themselves filled with grief, shock, loss, and are vulnerable and scared. By providing this support to the unit, these individuals will feel more supported by the police and community , making them more likely to participate in the legal process. Seattle Police Department's South Precinct will receive a grant for storage of long guns. Currently, long guns are stored in officer's personal lockers. With all the additional gear officers must carry, there is not enough room to securely store the long guns needed for tactical situations. Being able to securely and safely store long guns in an area with easy access means officers can be prepared to retrieve them at a moment's notice. Officer's ability to respond quickly to a tactical situation where a long gun is necessary is imperative in meeting our commitment to the public. Responding appropriately, and quickly to calls for service enhances community trust in our ability to safely resolve emergencies. 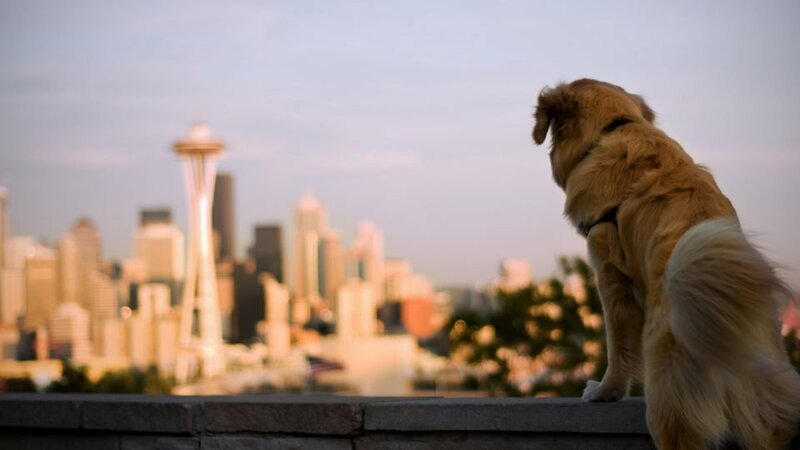 The 'Paws on Patrol' program encourages dog walkers to serve as an extra set of eyes and ears for SPD. There are hundreds of dog walkers throughout the community who are walk throughout neighborhoods daily. Paws on Patrol trains these individuals on how to effectively observe and report suspicious activity. The Southwest Precinct area is a very dog friendly community and is a perfect fit for this new program. Funding of this program will go to purchase dog tags, as well as print materials for community members who may be interested in participating. "I believe this program will have a very positive impact on the relationship between the SPD and the community. I believe this is one more way in which we can reach our community to encourage participation with us and to encourage the reporting of suspicious behavior." The SPD Bike Patrol program has grown considerably since the first patrols that were done on the streets of downtown in 1986. The utilization of bicycles as a patrol resource has grown throughout the city with wide ranging benefit. Funding of this grant will pay for an advanced mountain bike skills class that will develop officer's skill level. This training will raise the bar of skill development of our bike officers, giving them the tools to accomplish their missions in a safer more effective manner and allow them to deliver our services to the community we serve. The South Precinct Community Police Team participates in numerous event throughout the year. Officers hand out safety information as well as police-themed gifts to children and parents in the community we serve at each event. This grant will fund the purchase of small gifts for officers to give away to youth and families with the hope that it creates a positive sustainable relationship between the Seattle Police Department and the community. 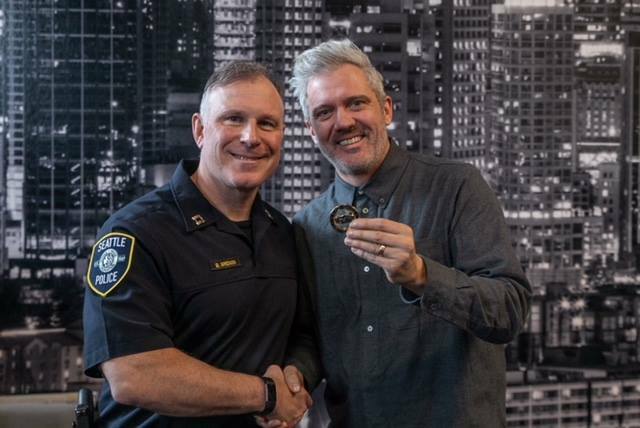 "I want to personally thank the Seattle Police Foundation for helping South CPT purchase items to give away at our events. I have never worked in a position before where I feel I have been able to make such a positive impact in the community. The opportunity for my team to hand out police related items to kids and families has been incredibly impactful." Funding of this grant will allow 25 officers to attend a two-day training course on "Human Mapping and Human Behavior Pattern Recognition." The goal of this course is to enhance officers' ability to perceive threats. After attending the course, officers hope that criminal and suspicious street activity can be spotted more quickly allowing them to be more proactive and make our community safer. Audio Forensics is a discipline within the digital and multimedia evidence field for Forensic Science and relates to the acquisition, analysis, and evaluation of sound recordings. Audio recordings used in police investigations are typically made in uncontrolled environments where quality suffers. Voices mix with other recorded sounds, making intelligibility difficult. Recordings from body cameras, 911 tapes, and interview room recordings with poor audio can benefit for enhancements and analysis in preparation for investigative and legal proceedings. This type of forensic analysis can provide evidence that will give new investigative leads, exonerate an innocent person, or implicate a suspect. The SPD Video Unit has seen a large increase in requests to clarify and enhance audio. Funding of this grant will be used to provide Video Unit technicians with the tools and training to properly fulfill these requests. When there is a bomb threat, the men and women of the Seattle Police Department Arson/Bomb Unit are called in to keep citizens safe. But how can we make sure that the Bomb Unit technicians aren't hurt? That's where the Seattle Police Foundation steps in. Using funds reserved to purchase items like service enhancements, SPF recently fulfilled a grant request for eight Cap Containment Devices (CCD). These CCDs will allow members of the unit to safely contain a detonator of a an IED and prevent injury. 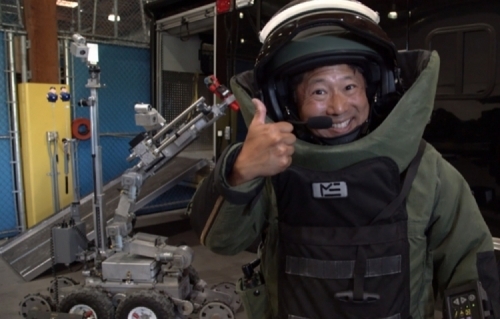 SPD Detective Scott Kawahara has said, "Since the Boston Marathon bombing you have seen bomb technicians out on foot for most major crowd events, concerts, and sporting events checking and clearing suspicious bags or packages. These CDCs will significantly raise the level of safety during our unit training and demolition procedures." The roll call room is where patrol officers start their shift. It is a chance to start the day off on a positive note, boost morale, and can serve as a motivator to provide the best policing. Many officers who work in the South Precinct have been feeling a lack of morale due to negativity around policing. With help from SODO BIA, the Seattle Police Foundation's grant will provide a new mural in the South Precinct roll call room. "Seeing this mural will serve as a daily reminder of the people, places, and activities we love and are here to protect. Photos help us remember the past and preserve memories. SPD's motto - 'Service, Pride, and Dedication' together with photographs showing the best of our precinct would serve as an encouraging place for our officers to start their shift, which will help motivate them to continue building the strong relationships with the community that this work requires." Fencing barricades are often used by officers during street festivals and demonstrations around Seattle. The fencing equipment is stacked and stored on carts to allow them to be transported when needed. The wooden carts currently used are old and in terrible disrepair. With funding from the Capitol Hill Block Party, the Seattle Police Foundation grant will fund the creation of new metal carts. These carts will be durable and effective, allowing officers to set up for road closures, events, and incidents safely and effectively. They will also provide a lasting solution to the storage concerns for the number of barricades, and allow them to be easily relocated by staff without damage or injury. In early 2017, SPD developed a parking lot signage project in cooperation with the Downtown Seattle Association, where a sign advising citizens to "remove your valuables and lock your car" was made. During the following 6 months, the department saw significant reductions in thefts and car prowls at the locations the signs were placed. With Seattle's population increasing, the Department wants to get ahead of car prowl issues at new construction locations and continue to offer these signs free of charge as an incentive to business owners to install them on their properties. Funding for this grant will give each of SPD's 5 precincts a ready stock of signs for new construction projects or hot spot locations. It is the Department's hope that these will reduce crime and increase public confidence in the department as well as enhance our reputation as an innovative police agency that uses strategies to reduce property crime through prevention versus random patrolling. The South Precinct Bike Unit has used an ineffective van to deploy officers. The van has been difficult to work with especially when equipment and officers are in multiple locations. SPF's grant to the unit will allow for a bicycle rack to be purchased. The new equipment will allow for 9 SPD Mountain Bikes to be rapidly deployed in any area the South Precinct serves, enhancing patrol efforts in the community and making it easier to respond to calls for service. "Being awarded the grant for the vehicle bicycle carriers is going to change the way the South Precinct Mountain Bicycle Squad deploys. First, we can use the department patrol vehicles, something we could never do before as a unit. Due to the large area covered by the South Precinct, we have been constrained to a smaller area. With the racks, we can load up and take the bikes where we are needed, becoming a better used asset to the already strained patrol officers. Also, we can quickly deploy all over the city to the large range of events where people are expressing their 1st Amendment rights, which is very cumbersome with our current means of transportation. Finally, we can better cover the whole precinct, having better access to a computer to do records checks and write reports. I cannot put into words how important this is to us as bicycle officers. The Seattle Police Department is known throughout the nation for use of the bicycle for modern day policing and with approval of the grant, we've been made even better." For more than a hundred years, the Seattle Police Department has had a Mounted Patrol Unit. The highly visible and approachable horses draw the young and old alike to an open conversation with police officers while discouraging criminal acts through their presence. Although officers are not generally doing highly technical riding, the urban environment they ride in is very challenging for the horses. They are constantly bombarded with things that startle, scare, and stress the horses. If the horse and rider aren't comfortable and confident in their abilities to keep each other safe, it can lead to dangerous situations. Ongoing professional training is essential to maintain this highly-specialized unit. Recently, officers in the unit started researching different types of horse training and discovered the methods of famous horseman Buck Brannaman. Buck is widely known for his magical ability to calm unruly horses and was the inspiration for the film The Horse Whisperer. Several members of the unit took it upon themselves to learn Buck's methods with fellow trainer Shayne McGinnis at McGinnis Meadows Ranch in Libby Montana. When they returned and began to implement what they'd learned, the results were astonishing. Horses that previously would startle, bolt across roads, bite, or throw riders are now being ridden safely. In an effort to assist the Mounted Patrol with continued training, the Seattle Police Foundation was honored to fulfill their grant request to send the entire unit to the McGinnis Ranch in August. 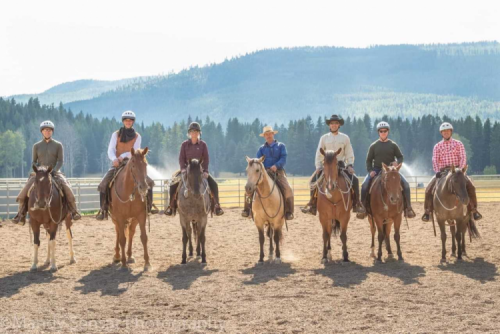 Officers have noted changes in their horses that they attribute the outstanding training they received at the ranch and techniques they learned from Shayne and Buck. The Seattle Police Department has 54 officers who are also Emergency Medical Technicians. The EMTs provide valuable medical response to members of the community and fellow officers in locations the Fire Department is unable to go. SPD utilizes its EMTs to work large protests, special events, and tactical situations. SPD EMTs spend their own time and money to maintain their certification and purchase equipment needed for their duties. With the funds donated by SPF, the EMT unit is purchasing two large medical kits to be used in support of their mission and to ensure they are prepared should the worst happen. Police officers are exposed to a variety of potentially traumatic events. The SPD Peer Support Team is trained to recognize signs of stress in officers and assist them in developing coping and self-care strategies to alleviate symptoms they may be experiencing. Funds provided by Seattle Police Foundation have been used to purchase books to help officers manage stress after incidents of trauma. Seattle Police Department's Apparatus Response Team (Cut Team) is deployed to remove devices from protestors who are blocking entrances to businesses, sidewalks, and city streets. They use a variety of tools including saws, drills, jackhammers, etc. which create dust, metal shards, and hot sparks when cut. Personal Protective Equipment is not issued to any members of the team. The grant issued to the Cut Team will provide gloves, ear protection, heavy duty overalls, and protective clothing for every member of the team. This equipment will enhance officer safety and allow officers to accomplish the task before them more quickly and easily. The SPD Hostage Negotiations Teams (HNT) responds to more than 50 events a year in an effort to de-escalate critical situations and maximize safety. Their work is often done behind the scenes. The current vehicle the team operates out of is unmarked and often confused with SWAT or Bomb Squad vehicles. With funds provided by Stacey Sanner, SPF's grant will purchase highly visible decals for the vehicle. "We believe that identifying the vehicle as a negotiations platform will help to acknowledge the importance of our work and demonstrate to the community our commitment to the negotiations process." Over the past several years the Gang Unit has increased its surveillance operations as part of its overall mission to arrest, prosecute and incarcerate violent gang members. This type of work involves countless hours of undercover surveillance and documenting criminal behavior when observed. This can only be obtained by high quality surveillance equipment. This grant will fund the purchase of a Nikon D500 camera and long range lens. Once purchased, the camera will be immediately deployed with detectives during surveillance operations. The Gang Unit conducts these operations regularly and the opportunity to produce high quality photos of gang members during criminal investigations for prosecution will enhance our ability to put violent criminals in prison, making our community a safer place to live. 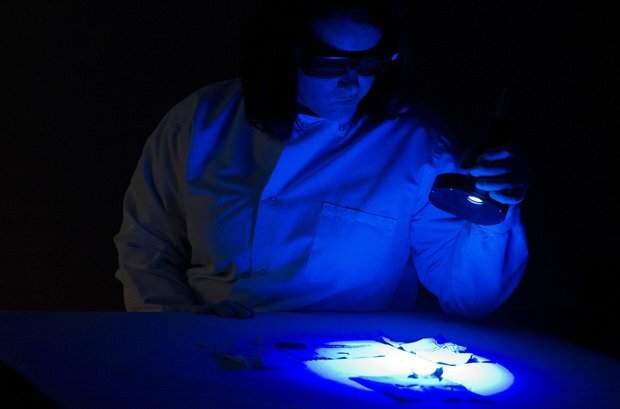 The Forensic Photo Unit along with the support and help of the Latent Print Unit (LPU) plan to expand its forensic capabilities by purchasing a portable Alternate Light Source System (ALS). New technology has made the ALS system portable to use on scene and in laboratory settings. A portable ALS would greatly enhance police services and provide the Seattle Police Department Criminal Investigations Bureau with an additional investigative tool that it currently does not have. Examination of crime scenes using an ALS can assist in locating and identifying potential evidence. This type of examination utilizes the inherent luminescent properties of materials (biological fluids, fibers, latent prints) exposed to monochromatic light to help locate these items which would otherwise go unseen. The impact of the purchase of a portable ALS through this grant will enhance SPD's relationship with the community by reassuring the community of Seattle that SPD investigates crimes thoroughly with excellent police work and cutting-edge technology.